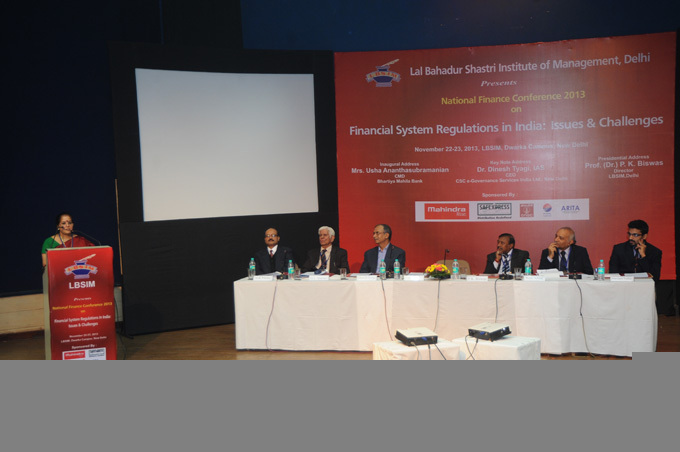 Lal Bahadur Shastri Institute of Management has conducted a National Level Finance Conference on Financial System Regulations in India: Issues & Challenges on 22nd & 23rd of November, 2013 at its campus in Dwarka. The conference focused on the issues and challenges in creation, administration and management of regulations pertaining to Indian financial system. The Welcome Address and Presidential Address were delivered by Dr. G.L. Sharma, Advisor, Management Grid, LBSIM and Dr. P.K. Biswas, Director LBSIM respectively. Dr. Alok Pandey, Conference Convener, briefed the delegates about the conference and its theme. Mrs. Usha Ananthasubramanian, First CMD, Bhartiya Mahila Bank, in her inaugural address, emphasized the need for a 'super regulator' and need for regulations that protect the system but at the same time do not restrict entrepreneurship and innovation. She also addressed Late Shri Lal Bahadur Shastriji as the ‘commoner Prime Minister’ and his unblemished reputation. The keynote speech was delivered by Dr. Dinesh Tyagi, IAS, CMD CSC E-governance Ltd. where he gave an insiders' perspective on the financial services industry and highlighted that the regulators should have power to punish as well so as to incite fear and ensure compliance to rules. The first technical session on the theme “Banking Regulations: Practices and Regulatory Architecture” and was chaired by Dr. Vinay Nangia, Professor of Finance & Banking, Dept. of Management Studies, IIT Roorkee and co-chaired by Shri. K. Ram Mohan, COO & GM Risk Management, PNB. The session included discussion on topics like Management of emerging issues on regulations in commercial banks, credit risk management practices, Basel III norms and role of central banks in the financial regulatory architecture. Two research papers, by Dr. Deepak Tandon, Professor International Management Institute, New Delhi and Ms.Priya S., Research Scholar Jawaharlal Nehru University, New Delhi were presented during the session. The second technical session was based on the theme “Insurance, Pension Funds and Accounting Reforms” which was chaired by Shri Sanjeev Chanana, Executive Director, Oriental Insurance Company India, Ltd. and co chaired by Mr. Aakashdeep Chakroborty, Former Joint Secretary Law CIC & currently Registrar TDSAT. Mr. Sudhir Sharma, Advisor (Finance), Delhi Electricity Regulatory Commission shared his views on the accounting reforms in India, specifically the government sector. Ms. Gargi Pant, Harsh Purohit, Bansthali Vidyapeeth presented her research paper on Pension Reforms and Government Expenditure on Pension in India and Mr. S.K.Mishra, Financial Controller PTU shared his study on ' Issues and challenges in Adoption of International Financial Reporting Standards (IFRS) in India' in contrast to the worldwide implementation of IFRS. The third technical session, held on 23rd Nov 2013 was on the theme “Capital and Commodity Markets Regulations”. The session was chaired by Mr. Pankaj Vajpayee, President,Value Research India and co-chaired by Mr. Navneet Arora, Navneet Arora & Co, Company Secretariat. Mr. Vajpayee elucidated that the general financial awareness is low in the country and hence the un-enthusiasm of investors in the markets. Ms. Nidhi Chaudhary, Banasthali Vidypeeth presented her research paper on ‘Is Indian Commodity Market Well Regulated?’ and emphasized the need for financial literacy again. Mr. Siddharth Roychoudhary, SAIL presented a research paper jointly authored by Prof. Satarupa Roychoudhary, Army Institute of Management on ‘Chit Funds and Microfinance Regulatory Structure in West Bengal and its Effect on Investor Perception’. A panel discussion on “Financial System Regulations in India: The Road Ahead” was chaired by Prof. (Dr.) V.K. Mehta, Professor – Finance LBSIM and eminent personalities like Mr. Ravi Khandelwal; Executive Director (Finance & Accounts), CONCOR India Ltd., Mr. Jagannadham Thunuguntla, VP Research SMC Capital, Mr. Deeptan Chakroberty, Sr. Vice President & Regional Head, Moti Oswal PrivateWealth Management Ltd. and Ms. Anubha Verma, AVP, Deutsche Bank participated in the discussion. It was an enriching discussion and got huge participation from the audience. The two-day conference concluded with a Valedictory Session by Mr. Rajnish Datta, Senior President, Human Capital Management, Yes Bank Ltd. who advised the students to ‘make their job their hobby and their hobby their job’ so as to have a fulfilling professional career. A bi-monthly Newsletter - ‘Finestra’ by Finesse, Finance Club of LBSIM was also launched by Mr. Rajnish Dutta. In all, 23 presentations were made out of which 18 were from senior practicing managers in various financial sectors.